The stunning, shiny brass finish of this decorative end cap will precisely match your Polished Brass two-inch outside diameter bar rail tubing. They're very easy to install, as the brass end caps slide directly into the tubing. With bar foot rail brackets, tubing, and components like these railing end caps available in a matching sparkling brass finish, it's easy to create a cohesive, sleek look throughout your bar. Put on floor and it is just what we wanted! Great quality items and very easy to install.?? Pops right in to finish your project. These fit right in to your 2" OD tube for a nice finish to the project. I would recommend some type of light adhesive since the fit is not super tight. Actually, I'm trying to reconstruct an antique brass rail bed handed down in the family and I needed caps for the top of the four bed posts that were missing. This is the only part I could find on the internet that looks like it will do the trick. the dome is easier to clean and has a nice smooth finish than the flush end cap. I looked at other options I have used in the past and decided your company was a better choice. 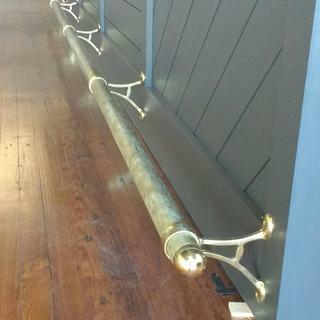 To put at the end of a brass bar rail. They look better than the flat end caps & more like a traditional foot rail. If I use the wood dowel for the footrail, can I use the brass caps on the ends? BEST ANSWER: Yes, you can but you will need to use an external end cap with the wood dowel rail. The domed end cap will not fit over the 2" OD wood dowel. It is actually made to fit INSIDE of the 2" OD metal tubing. Yes you can and i must say it look very nice.